International trips require careful budgeting and planning. For most of us, the idea of going abroad can start months or even years before the actual trip. You need time to save and time to plan. There are so many details that go into gearing up for your international trip. Where will you go? What will you see? Will you get the best deals on your flight or hotel? While these questions are important, most people don’t try to find the best deal for carrying or using foreign currency on the trip. It’s important to know your options and the benefits and risks that come with each option. Cash may be convenient and universally accepted, but it is often risky to carry and irreplaceable if lost. Traveller’s cheques were one of the first few options for people to use money abroad, but in this day and age have become expensive and hard to replace. Furthermore, if you are planning to visit multiple countries at once, then there is the extra hassle of handling multiple currencies. Therefore, the most lightweight solution for the modern traveller is a forex card – it’s safe, replaceable and pocket-friendly! In this case, we’ve done some research for you. Instead of googling each option separately and then weighing your options, check out our analysis on the different ways you can carry foreign currency to the country of your choice. Based on your trip and your needs you can assess which option works best for you. Remember, you have saved and budgeted for this, making the cash you carry incredibly vital for this trip. Your payments won’t be restricted to just souvenirs or food. You need to carry enough money to cover all your expenses – including any emergencies that might crop up on the trip. With some research and some smart choices, you can save even more money than you originally planned in order to fully enjoy your vacation. 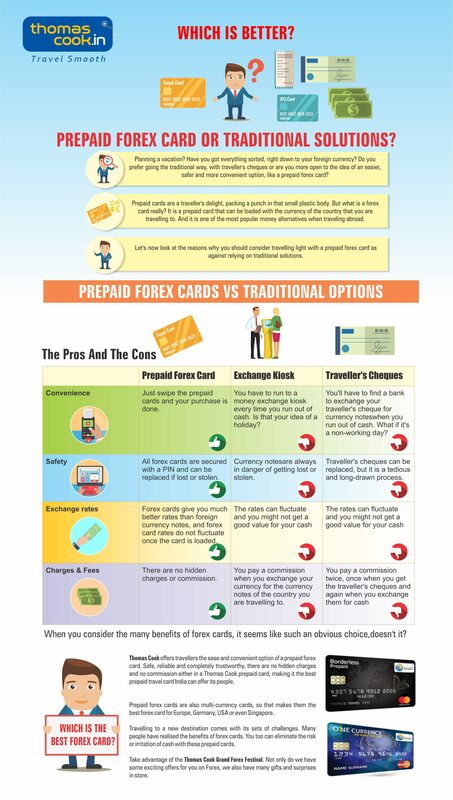 Check out Thomas Cook’s Forex Cards so that your trip remains hassle free.